Trump Heads to China – Is Chinese Investment Still Headed Here? Chinese foreign direct investment (FDI) in the US has grown rapidly in recent years, and hit $46 billion in 2016. But this year investment by Chinese companies dropped significantly, with the value of newly announced US takeovers down 67% in the first three quarters compared to 2016. This mostly reflects Beijing clamping down on capital outflows, but US politics also play a role. President Trump’s upcoming trip to China offers an opportunity to re-kindle positive momentum around bilateral investment. 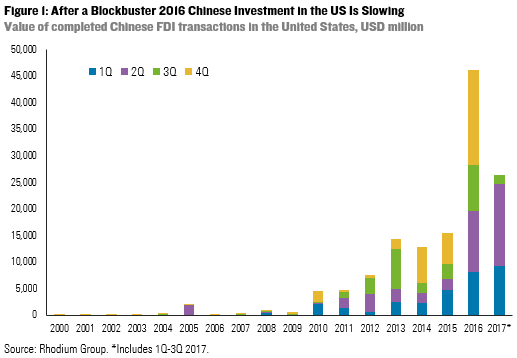 After a blockbuster 2016 with more than $46 billion of acquisitions and greenfield projects, Chinese FDI in the US has slowed substantially in 2017. In terms of completed deals, the slowdown was not as visible since several billion-dollar acquisitions announced in 2016 were carried over and closed in the first half of the year. Among them was HNA’s $10 billion acquisition of CIT’s aircraft leasing unit and $6.5 billion investment in Hilton Hotels. Because of those deals, the value of Chinese FDI in the US was only down 7% in the first three quarters of this year from 2016. However, these numbers miss a more dramatic slowdown in new deal making. The M&A deal pipeline (deals announced but not yet closed) dropped from a peak of $27 billion in 3Q 2016 to only $8 billion in 3Q 2017. This thinner pipeline has also translated into lower value for completed deals in recent months. In 3Q 2017, Chinese firms closed 28 transactions worth $1.7 billion, the lowest quarterly value in almost five years. For the full year, we expect the value of completed Chinese FDI transactions to remain below the $30 billion mark. The main variables for explaining this precipitous drop in Chinese deal activity is Beijing’s crackdown on outbound capital flows since the end of 2016. In the second half of 2016, Chinese authorities began informally clamping down on certain types of “irrational” outbound investments (an approach that became official policy through a new OFDI regime in August 2017). Greater scrutiny for certain types of overseas investment clearly impacted the level and mix of Chinese outbound investment in the US and globally. According to China’s Ministry of Commerce, China’s global OFDI dropped 42% in the first nine months of 2017 compared to 2016. The value of newly announced global Chinese acquisitions are down 31% yoy in the same period. Large billion-dollar deals have largely disappeared and investments in blacklisted sectors has vanished (real estate, hospitality, cinemas, entertainment and sport clubs). State-owned and sovereign investors have expanded their role in China’s overseas investment footprint at the expense of private and financial investors (which have been driving US investments in recent years). While China’s re-imposition of capital controls is responsible for most of the drop, deal risk is magnified by the complex political mix that has been stirred up in Washington. While security screenings have always been one hurdle to successful investment in the US, a new tide of challenges to the post-WWII American commitment to investment openness has rolled in. Businesses are reporting with increasing frustration that national security reviews at the Committee on Foreign Investment in the United States (CFIUS) are taking much longer than before, due either the slow appointment of key senior officials at relevant government agencies, or politicization of the process, or real complications in analyzing national security questions. This applies to all foreign deals of course, not just to China, but with the most marginal deals now coming before the Committee, Chinese investors are impacted the most. At the same time, Congress is considering new legislation to increase CFIUS scrutiny and expand its scope, in response to perceived security risks related to Chinese high-tech investments. The legislators leading this effort, including Senator John Cornyn of Texas, intend to introduce bills for debate in the coming weeks. This White House has been aloof on the subject of Chinese investment. It is not clear whether the President is comfortable with traditional American openness to global investment, or, conversely, if despite a lifetime welcoming foreign financial partners to help propel his domestic empire, the President has determined that times have changed and Chinese FDI is a Trojan horse that should not be let in. The economic nationalists who shaped the messages which got Trump elected are highly allergic to Chinese FDI, no matter how private and low-tech. The national security community the Trump Administration has gotten to know since arriving in Washington has a different reason not to shake hands with China Inc.: they are concerned about the strategic and military benefits conferred on China by its growing FDI footprint. Recent signals – including the characterization of Chinese acquisitions in the US as an “unfair” attempt by the PRC government to systematically transfer technology to China (see the 301 Investigation) – indicate that the administration is headed toward more restrictiveness on FDI, though at the same time some officials talk about landing big deals. This mishmash of mixed signals amounts to less certainty and assurance of due process than the US has seen in generations, and this plays a significant, if secondary, role in the drop in Chinese deal flow. 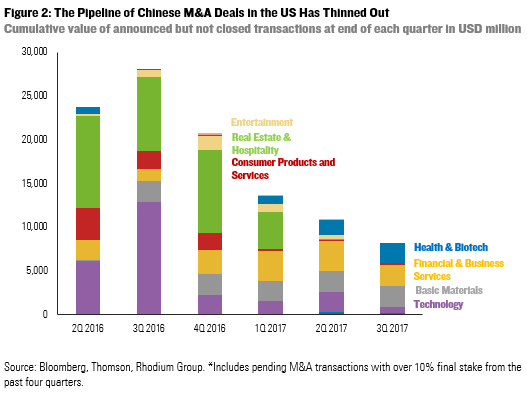 It is notable that the drop of newly announced Chinese M&A transactions in 2017 is much sharper in the US than in other regions: The value of newly announced M&A deals in the US dropped 67% from January to September, compared to a drop of only 23% in the rest of the world. In other parts of the OECD, mostly in Western Europe, the volume and value of new deals are already back to 2016 levels. There is unprecedented commercial appetite for greater two-way FDI flows between China and the US, but a high degree of political uncertainty on both sides. Upcoming meetings between Presidents Trump and Xi could help clear up some of those uncertainties and re-establish the positive momentum for two-way FDI flows. President Trump should re-affirm America’s open investment policy and welcome productive Chinese capital. He should explain to his Chinese counterpart why reforming CFIUS screenings may be necessary, and in fact are a prerequisite for keeping the US door open. These two stances are not incompatible: even if the US doubles the diligence with which it parses Chinese FDI for security concerns, there is ample room to grow the value of Chinese FDI in the US by an even greater multiple. Finally, President Trump should also emphasize the importance of China fulfilling its pledges to level the playing field for US companies in China. Without greater reciprocity in market access, popular support for economic engagement with China will continue eroding, making it difficult to keep doors open. Trump should announce a US return to the negotiation table for a bilateral investment treaty and encourage President Xi to demonstrate China’s seriousness by promptly implementing its new FDI regime and unilaterally liberalizing industries that are overdue for a level playing field.